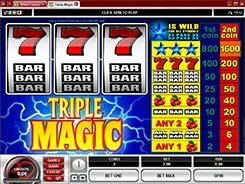 Triple Magic is a three-reel slot at its basic. 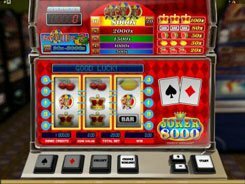 Like in most other classic machines produced by Microgaming, a coin size in this slot ranges from $0.25 to $5, and the maximum wager is $10 per line, per spin. 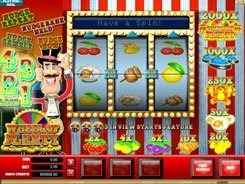 Played over a single payline, the slot features classic cherries, bars and sevens. There is also a themed Blue Star symbol that acts as a wild. 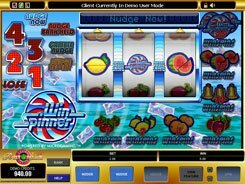 Hitting 1, 2 or 3 cherries across the payline awards up to 40 coins. 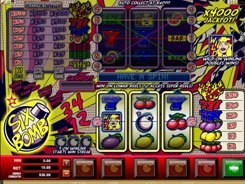 Bars and sevens create more profitable combos paying out up to 200 coins for three of a kind. 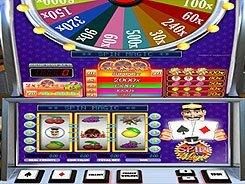 Besides, any set of three mixed Bar symbols is considered to be a winning hit that will net you a 6-coin payout. The Blue Star is the biggest payer in the game. 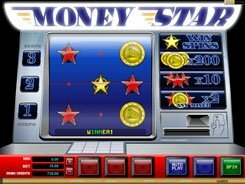 Getting three Blue Stars aligned across the payline awards 1600 coins (up to $8000) if making a 2-coin bet, or 800 coins (up to $4000) on a 1-coin wager. As was mentioned above, the Blue Star acts as a wild, wild multiplier. First off, the wild substitutes for all other icons and help complete a winning line. Second, the wild multiplies payouts x3 or x9 times when contributing to a combination.